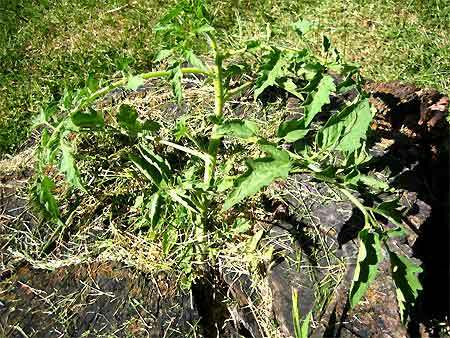 I did some work in the garden on Sunday afternoon, and as I was carrying compost and equipment back and forth, I noticed a new plant growing out of the stump in the middle of the grass. It looked awfully familiar, this plant, with its notched and pointy leaves and its fuzzy stem. I walked by it about three times, noting it each time, before I finally stopped and took a closer look. Was it possible? Could it be? I finally crouched down, pulled off a leaf and smelled it. Then I giggled. Yes, people, I have a tomato plant growing out of a tree stump in the back yard. And I swear I’m not responsible. Way to go, Genie! That’s what makes gardening so much fun! Isn’t that funny? I have two tomato plant that volunteered to grow in my firepit, right from the ashes and coals. I had thrown nasty green toms there last winter. Neat how plants will grow where there is just enough of the right components for growth. Seeds germinate in the darndest places, don’t they? Yet sometimes when we try to sow them with perfect conditions, they balk! I wonder if this tomato will flower and set fruit before the first frost? Perhaps it is like the short story “The Monkey’s Paw” where the tomato plant you tortured by hanging it in a basket has somehow wished for a good place to grow and it grew out of your stump, which when you think if it is all that’s left of the deep, deep roots of a tree. But it’s a dead tree which is the “gotcha” part. Or perhaps this plant will grow mighty roots that will disrupt swere systems all over town. Oh, Ciara, that makes my head hurt. I plant stuff in stumps all of the time. Or in the space where a tree has a “V” … tomatoes have such a sense of humor. “Then I giggled.” Me too! Who says plants don’t have brains. That tomato is definitely messing with you. I love it…tomatoes are good for that, aren’t they? Lydia, I don’t know if I deserve accolades — I really didn’t do anything but notice the plant — but it is pretty funny, nonetheless. And now…I’m kind of thinking the stump might be a good place to plant things! Heyercapital, that’s really bizarre — I assume you haven’t gotten much use out of the firepit, then? Or did you move the plants? Growthumbs, and who knew the dead stump had so much life in it?! AB, I like the idea of planting things in the v of trees…interesting! Heather, someone’s messing with me, for sure. I’d bet the rabbit got into a gardening mood and figured a tomato growing out of a tree stump would be a fine place to grow some veggies. Kate – I had a similar thought – I was thinking of the squirrels and what messy eaters they are. Small payback for the ones they ate! Who says that tomatoes need coddling? Ottawa Gardener, mine have gotten much less coddling this year than last, so apparently whoever says that is wrong! Tomaotoes “don’t need nuthin'” but a sturdy stake to support the weight of their fruit … and that’s what I have to add. AB, if this tomato hangs in there, a stake it’ll get. I’m not sure how I’ll drive said stake into the stump, but I’ll figure it out. I nice three-inch nail might do the trick. (For getting the stake to stick to the stump.) Oh my. I bet it wasn’t a walnut tree stump. Chigiy, you know, I’m actually not sure what kind of stump it is, but you’re absolutely right — there’s no way it’s a walnut tree stump!